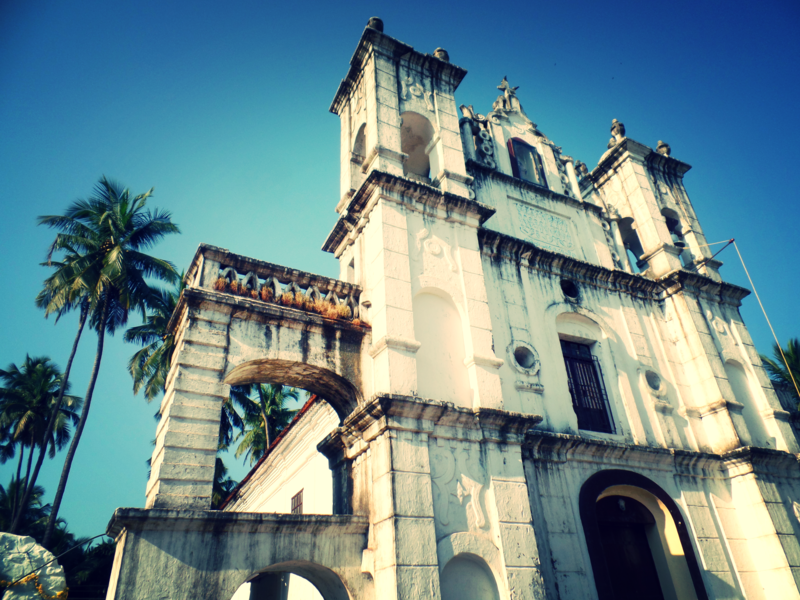 Vagator was one of our favourite places in Goa, it’s so beautiful. Vagator has three beaches, Ozran the smaller of the three is tucked away in a little cove below a high cliff. Big Vagator beach is where you’ll see lots of people gather for the incredible sunsets and next to it is Vagator Beach with long stretches of sand. Goa is very seasonal so the prices will depend on when you visit. They certainly are not Northern India prices so be prepared to pay more. We decided to go more upmarket than the usual backpackers haunt for our friend’s Zoe birthday. We stayed here for 4 nights, 2 in a deluxe room and 2 in a villa. We split the cost between 4 of us so it actually works out a good price. The resort has a long driveway keeping you away from the road .The Deluxe rooms surround the pool and the villas are tucked away with a very Wisteria Lane feel. We spent a lot of time in the pool and reading on the sunloungers. The food wasn’t that great however, there are amazing restaurants a few minutes walkaway. The wifi only worked by the pool which was annoying but then think of it as a detox. We had a look around here, it has more of a backpackers feel than Leoney’s. The reviews on Trip Advisor rate Bluebird for the food so even if you don’t stay here it might be worth visiting the restaurant. I can’t find prices online however I remember thinking they were overpriced for just a plain room and shared bathroom. A well maintained resort with 14 cottages overlooking the beach, the reviews are excellent and the rooms look like luxury! Vagator is known for its superb restaurants on offer. You’ll see no McDonald’s here, it’s health conscious with vegetarian, vegan and gluten free options available. 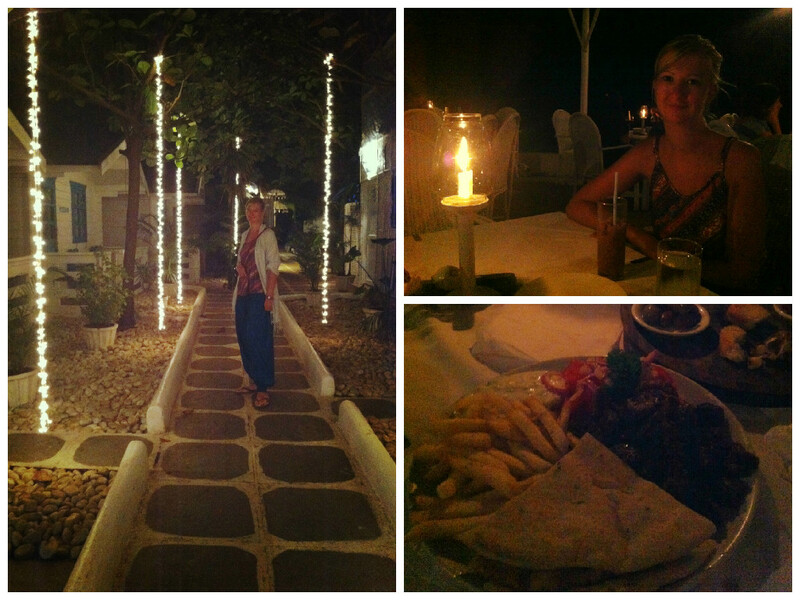 This was our favourite restaurant in all of Goa. Think idyllic charm surrounded by hundreds of plants and cute animals. We met the owner who was very friendly and helped us choose our meal. We came back about 5 times. I ordered a bowl full of prawns, deliciously cooked in butter and garlic for about 300 rupees (about £3!) The hummus was some of the best we’d tasted and we loved the curries. Thalassa is a popular Greek restaurant perched on the clifftop overlooking Ozran Beach. The restaurant was buzzing with people, white curtains billowed out to sea and the smell of food was intoxicating. The portions were huge yet we managed to share a dessert. You can also stay here in one of their little huts which you’ll pass on the way to the restaurant, prices from 3000 rupees per night. One of my favourite things to do here was taking my rented moped out for a ride. The roads are hardly busy and I loved looking at all the Portuguese houses. One evening we hired a taxi to take us to Club Cubana in Arpora which was a lot of fun. We arrived at the beginning of the season so the club wasn’t too busy and there was plenty of space to bust some moves on the 70’s style dance floor. On my last night in Vagator I went by myself to the clifftop to watch the sunset. I met a local woman called Candice and she invited me over for dinner and we went out dancing that evening to Club 9 Bar. Candice was a fantastic cook, when I met her she was in the process of starting her own restaurant so keep a look out! I loved Vagator! It’s everything I pictured Goa to be and more. Everywhere is so green and tropical and the people I found were friendly and inviting. 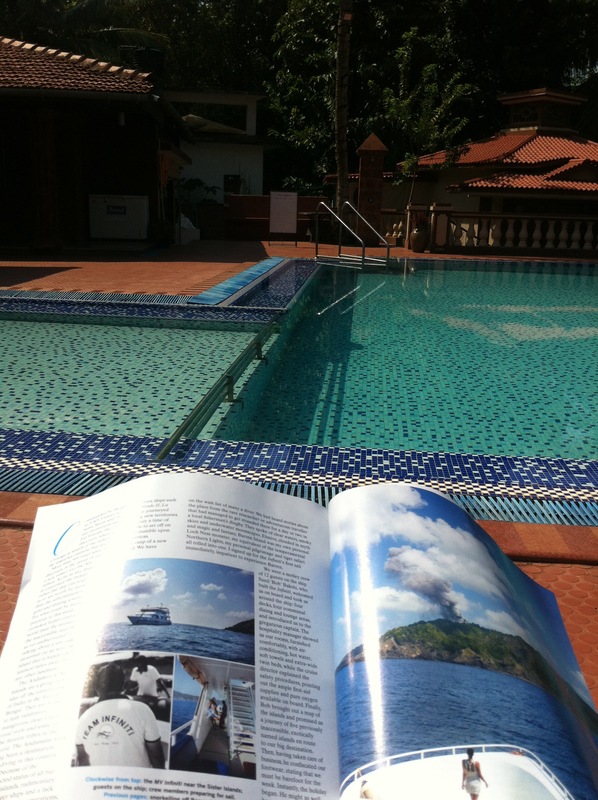 I’d liked to try a new place to stay next time and I’d certainly go back to Sri and Thalassa.